The simplest Active Directory definition is that it is a directory service designed for Windows operating systems. But what does this actually mean? What is Active Directory used for? How can you manage it? Whether you are a new system administrator who wants to learn Active Directory basics, such as its structure, services, components and essential terminology, or a seasoned administrator looking to find new best practices for AD management and improve your skills even further, this e-book has something for you. MS Active Directory can seem overwhelming, even to experienced admins. This e-book helps you to get a solid grasp on what it is all about; it is an Active Directory cheat sheet, if you will. 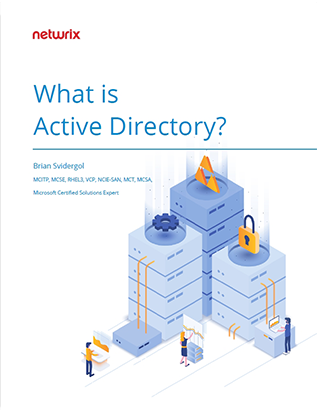 You might have questions about what is included in the directory service technologies from Microsoft: What is Active Directory Domain Services, what is Active Directory Federation Services and so on? You might be confused about the structure of Active Directory and need to know more about domains, domain controllers, forests, trees and trusts. Or perhaps you want to know more about Active Directory administration and auditing. Whatever your questions about AD, this e-book has you covered.